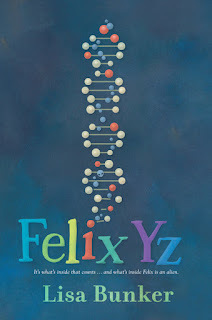 For MMGM, I am recommending Felix Yz by Lisa Bunker. Before I tell you all of the ways in which I loved this book, I first want to tell you that I originally heard about this book in a review by fellow MMGMer Greg Pattridge on his blog, Always in the Middle. (If you haven't been to his blog before, I suggest you do so immediately!) I am so glad that I bought this book for so many reasons! In the book, a teacher of Felix's explains to him that he has his own writing voice, which set the bar high for me, as a reader. Luckily, I was not disappointed! The way the sentences are written and the words used, you can practically hear Felix narrating the story. As you've probably noticed if you've read the description, Felix Yz has a very unique premise. The premise only gets more unique as the book goes on, however, with many other things, including an adventure-related plot point, coming into play. Even things that might be expected are still done well, such as Felix's often-humorous interactions with Zyx that lighten up some of the more depressing scenes. Finally, one of the book's major topics is gender. From characters who love others of the same gender (including Felix) to one who changes gender often and even a minor transgender character, Felix Yz shows that not conforming to gender norms is perfectly okay and irrelevant to who you are as a person. 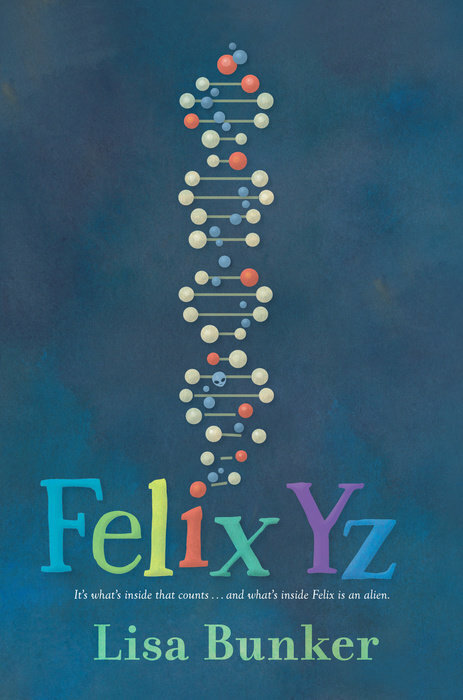 Every reader will find something to love or relate to in Felix Yz, making it a truly amazing read for anyone! For MMGM, I am recommending Fish in a Tree by Lynda Mullaly Hunt. The author of the beloved One for the Murphys gives readers an emotionally-charged, uplifting novel that will speak to anyone who’s ever thought there was something wrong with them because they didn’t fit in. I really enjoyed this book! This book discusses a topic found in few books: dyslexia. The main character, Ally, has, but is not diagnosed with, dyslexia, making it hard for her to do schoolwork and even read a menu (as seen in one point in the book). As a relative of someone with dyslexia, I find the portrayal of Ally's symptoms and struggles very realistic. The book also discusses topics such as bullying (a girl named Shay relentlessly makes fun of Ally) and friendship (Ally befriends two kids, Keisha and Albert, who also deal with Shay). The characters in Fish in a Tree are fully fleshed out, from bullies and classmates to Ally's teacher, Mr. Daniels, who helps her overcome both her dyslexia and her shame because of it. In addition, the book strikes a perfect balance between happy and sad moments. 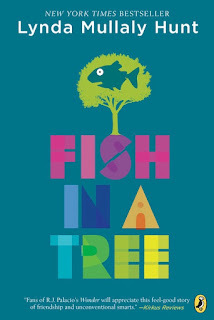 All in all, Fish in a Tree is both a great description of dyslexia and an enjoyable read for anyone! 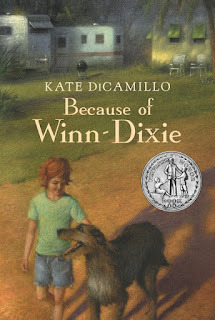 For MMGM, I am recommending Because of Winn-Dixie by Kate DiCamillo. When ten-year-old India Opal Buloni moves to Naomi, Florida, with her father, she doesn't know what to expect — least of all that she'll adopt Winn-Dixie, a dog she names after the supermarket where they meet. With such an unusually friendly dog at her side, Opal soon finds herself making more than a few unusual friends. And soon, Opal and her father realize — with a little help from Winn-Dixie, of course — that while they've both tasted a bit of melancholy in their lives, they still have a whole lot to be thankful for. One of the best parts about Because of Winn-Dixie is the varied lineup of characters, all of whom are central to the book. Some much younger than Opal and some much older, all of them have their own voices and troubles. Even Winn-Dixie is so well described, he seems to come to life. The book has several lessons in it, such as the importance of ignoring people's past actions and focusing on their present ones, or even just the awfulness of wars. The main character, Opal, has a great voice, and her backstory of having a mother who is not dead, but has left, is refreshing. The book is a short, quick read (being much shorter than another book by DiCamillo that I recommended, Raymie Nightingale) that is very enjoyable and not too sad. Anyone who reads Because of Winn-Dixie (a Newbery Honor Book), whether child or adult, is sure to love it as much as I did! 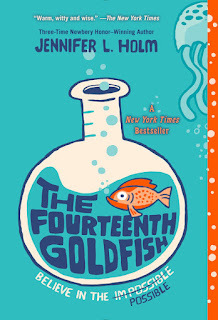 For MMGM, I am recommending The Fourteenth Goldfish by Jennifer L. Holm. Believe in the possible . . . with this New York Times bestseller by three-time Newbery Honor winner Jennifer L. Holm. A perfect Father’s Day read about a child’s relationship with her grandfather! Galileo. Newton. Salk. Oppenheimer. Science can change the world . . . but can it go too far? Eleven-year-old Ellie has never liked change. She misses fifth grade. She misses her old best friend. She even misses her dearly departed goldfish. Then one day a strange boy shows up. He’s bossy. He’s cranky. And weirdly enough . . . he looks a lot like Ellie’s grandfather, a scientist who’s always been slightly obsessed with immortality. Could this gawky teenager really be Grandpa Melvin? Has he finally found the secret to eternal youth? With a lighthearted touch and plenty of humor, Jennifer Holm celebrates the wonder of science and explores fascinating questions about life and death, family and friendship, immortality . . . and possibility. Look for EXCLUSIVE NEW MATERIAL in the paperback—including Ellie’s gallery of scientists and other STEM-appropriate features. This book is great! One thing that I love about it is its combination of life lessons (such as about the circle of life and about how scientific discoveries can change the world, for better or worse) and a story that is often funny and optimistic. The premise of the book (of someone reverting to a younger age and wanting to reveal the discovery so that people can avoid old age) is very unique and interesting, but the book is not really a science-fiction book, as opposed to a realistic story with some science-fiction thrown in. The book's main character, Ellie, is a great narrator for the story, and the way her life changes (such as by making new friends and losing old ones) is another great part of the book. 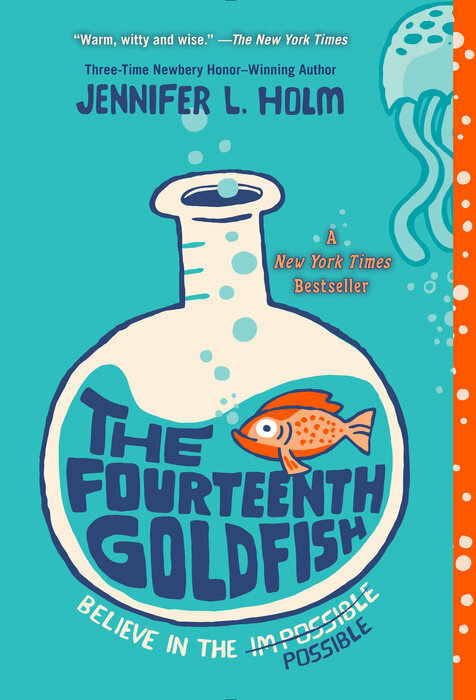 The Fourteenth Goldfish is a great read with many important things to say!